Lakisha (Homepage) wrote: That's 2 clever by half and 2x2 clever 4 me. Tanhks! foto-rolero54 (Homepage) wrote: Splendid bw! Ilger.nl (Homepage) wrote: O wow...well done. This proves you have an eye for nice shots. Sabine (fokuspoint) (Homepage) wrote: Great reflection. It makes the image very interesting. Remus (Homepage) wrote: Great reflection and tone. Beautiful structure! grant (Homepage) wrote: bravo! wonderful image! Michael Paulison (Homepage) wrote: The bend in that round building makes it appear as if it's trying to get a better look at its own reflection. Really cool shot! Pedro (Homepage) wrote: I like this buiding too. Perfect framing and b&w process. Regards. beanow (Homepage) wrote: Wow! Amazing effect! I love this B&W! Michael Rawluk (Homepage) wrote: Now that is a super shot with stunning processing. I absolutely love it. Krims@nline.be (Homepage) wrote: Superb capture, wonderfull contrast and use of light. Looks like a love story, ... two buildings trying to reach eachother. Congratulations! Robert Kruh (Homepage) wrote: You chose and captured brilliant Architecture! Riverside help you to see all building. Great view! Asgardr (Homepage) wrote: One of the cool things about photography is to see and learn how others look. I'm not familiar with this site at all but I probably wouldn't have framed it like this. But how cool a result! I really like it! TP@Photoskiasi.com (Homepage) wrote: Interesting building. Nice b/w tones and composition Paolo. Very good work. Frida (Homepage) wrote: Wow that's an unusual composition but it's really cool. Lunamania (Homepage) wrote: whoa, really interesting perspective--nice capture. sherri (Homepage) wrote: What an exceptional composition, Paolo. 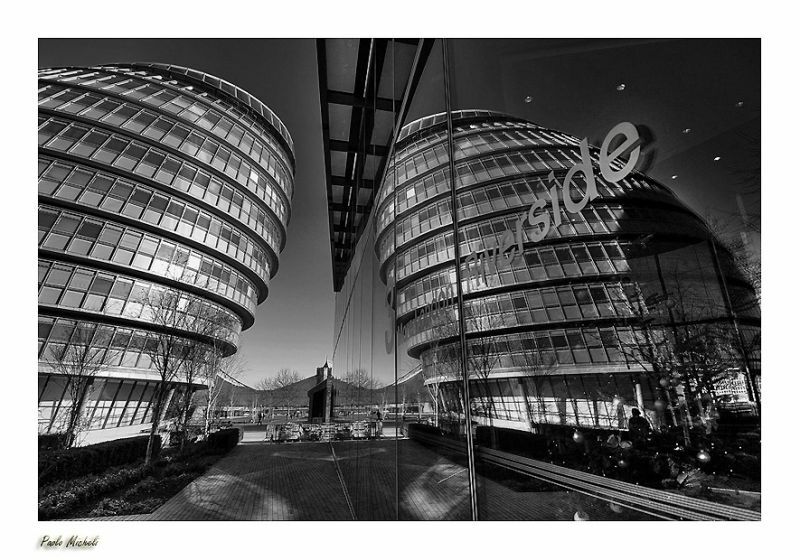 Nicki (Homepage) wrote: Great reflection game - the b/w and wide angle do a really good job, superb!